When: Tuesday, September 25, 8:30 a.m. – 11:00 a.m.
On Tuesday, September 25, the Southern Environmental Law Center and Virginia LISC (Local Initiatives Support Corporation) will release a new study entitled “Connections and Choices: Affordable Housing & Smarter Growth in the Greater Richmond Area.” The report focuses on the affordable housing, sprawl, and transportation challenges facing the Richmond region, the connections between these challenges, and opportunities to address them. During the symposium, Trip Pollard of the SELC and Frances Stanley with Virginia LISC will provide a comprehensive overview of their findings, followed by a panel response and audience questions and answers. Please RSVP by September 20, 2007 to attend this event by contacting Kathryn Burke at (804) 422-5010. A proposal to re-zone “Hundleys Corner” for condos (at Pole Green & Lee Davis roads) is on the Planning Commission’s agenda tonight (7 p.m. Hanover County Courthouse Complex, Administration Bldg.)! Please VOICE YOUR OPPOSITION to re-zoning this historical site! Gen. Stonewall Jackson camped at “Hundleys Corner” on June 26th, 1862 as he was on his way to reinforce Lee’s forces at the start of the SEVEN DAYS BATTLE at Beaver Dam. Jackson arrived late to the site (5 p.m.) and decided to camp for the night rather than push forward. That night, Jackson stayed at the Laurel Meadows home (listed on the National Registrar of Historical Places) while his troops camped in surrounding fields. Lee lost a significant position as a result of the lack of reinforcements. Ultimately, Gen. Jackson’s decision at “Hundleys Corner” affected the outcome of the SEVEN DAYS BATTLE and thus, the outcome of the Civil War. The property, currently zoned A-1, will be re-zoned for a high density, multi-family housing development. 1. Do NOT re-zone the site. Protect this property as a historical viewshed of the federally protected Laurel Meadow site. 2. Request time for consideration of placement on the National Registrar of Historic Places or expand the Laural Meadows registrar site to include “Hundleys Corner” (according to Federal Law 36CFR60). 3. There is a cemetery on the site: oppose re-zoning to allow for proper archaeological clearances to be conducted in fields surrounding the cemetery, utilizing ground penetrating radar to determine the location of unmarked graves. Virginia Antiquities Act (Va. Code Ann.10.1-2300, et seq). 4. Request disclosure if there is Federal money or permit involved in the development project. (ie – core of engineers permit sec. 106, wetland, or any federal loan sources). This proposed development THREATENS the “integrity of location, design, setting, materials, workmanship, feeling, and association…” of a place listed on the national registrar of historical places and is a site of local and national historical significance. Henry district, Janice S. and Granville Kirk Harris seek to rezone 15.12 acres from A-1, Agricultural District, to RS, Single-Family Residential District, to permit 59 age restricted units for a gross density of 3.90 dwelling units per acre. 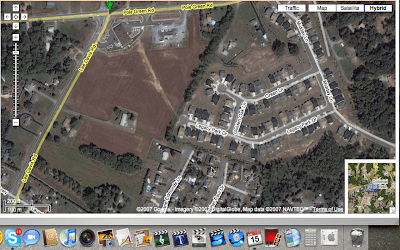 The parcel is located on the east side of Lee-Davis Road 500 feet south of its intersection with Pole Green Road. Area residents are worried about traffic volume, housing density, lack of adequate green space and pedestrian movement. The intersection of Pole Green and Lee-Davis Roads is already stressed, according to traffic consultant McCormick Taylor. The Historical Commission’s report cited difficulty in mitigating negative impacts on historic home Laurel Meadow, a cemetery and the Civil War battlefields on the site. Preservation of a treeline and installation of evergreen screening were also requested. The Commission also recommended that the density of the project be at the minimum rather than the maximum number of units allowable. The property is designated on the General Land Use Map as Suburban General (2-4 units per acre). Some focus areas for the Public Works Department were a drainage analysis for downstream property and systems; a detention basin or sewer line removal on the Legacy Park property line; and requirement of a dam breach analysis on an embankment. Planning staff recommended denial as submitted, but approval if outlined issues were satisfactorily addressed. The Planning Commission deferred a vote upon request of the applicant. 1862.”(11) Today one can see a monument that is dedicated to the 36th Wisconsin Regiment; it is located about a mile away from LaureI Meadow. This monument, erected by Charles A. 5. Janet Caggiano, ‘Laurel Meadow”, Richmond Ncws k d e r 14 Febmary 1990, HenricolHanover Plus. 6. James B. Spratley, ‘Laurel Meadow.” Hmover Counry Hislotical Bulleh 8 Way 1973). 7. Roben Undenuood, ed., Banles nndLedcrs ojrhe Civil Warvol. 2 (New York: The Century Co., 1964). 351. 9. Henry Kyd Douglas, /Rode Wirh Sconewall. Chapel Hill: University of Nonh Camlim Press, 1940. p. IW. 10. John M. Gabben, Miliray Opernn’on in Honover Counry, Virginia ( U.S.A.: Gunner Graphics and Printing Co., 1989), 28. 13. Hanover County Historical Society, 29. Instead of threatening our quality of life in Hanover County, Hanover County government might want to explore: the GREEN GOVERNMENT INITIATIVE established by the National Association of Counties (NACo). Launched in 2007, this initiative provides comprehensive resources for local governments on all things green, including air quality, transportation, water quality, land use, purchasing and recycling. CRG Forum on "Wiltonville" Tonight! Tonight at the Ashland Public Library, CRG will hold an interactive Public Forum on East Ashland. It will send a very strong message to have the library meeting room packed with concerned citizens. You will be able to question the town, county, and applicant. As mentioned before, we will be experimenting with a new format that will keep the forum structured, but will also allow more give and take (follow-up questions, rebuttals) with the panel. The East Ashland Public Hearing on July 25th was attended by at least 90 people. The hearing was covered by the RTD, Herald Progress, and Channel 8. Twenty-one people spoke; with only one speaking in favor. The application has been deferred until August 21st. The council will meet with the applicant in a work session on August 7th, 6:00 p.m. to discuss traffic issues only. There will not be public input regarding traffic at the 8/7 meeting, but the public can attend this work session and listen to presentations and discussion. CRG strongly encourages you to contact the Ashland Town Council with your thoughts, concerns, and questions. Contacting them before a public hearing at which they may vote, gives them time to really consider your ideas, perhaps research ideas, or contact you for clarification/discussion.